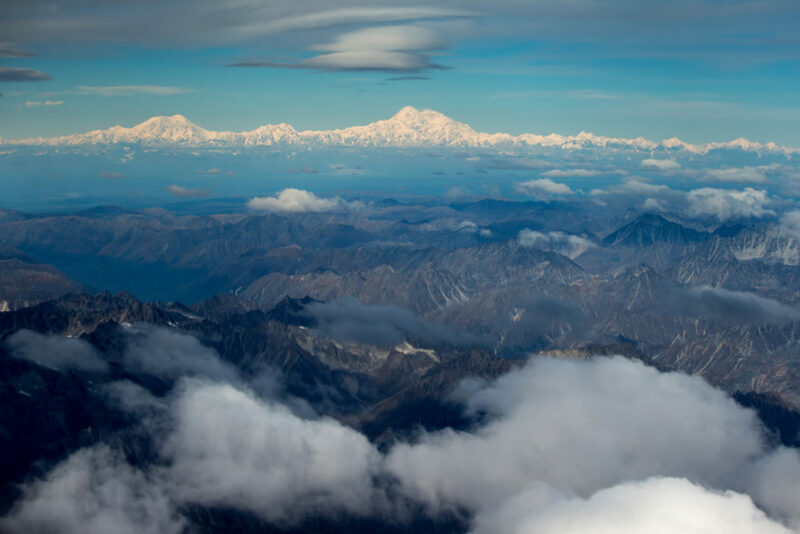 While Lower 48 politicians might have partisan heartburn over President Barack Obama’s decision to change the name of Mount McKinley to its Koyukon Athabascan name, Denali, you’d be hard pressed to find many Alaskans, conservative or otherwise, with objections. At Monday’s GLACIER conference on Arctic issues, put on by the State Department in Anchorage, one of the biggest applause lines came during Secretary of State John Kerry’s remarks introducing Obama, who is spending part of the week touring Alaska. “I think we can say that Denali never looked better than it does today,” Kerry said, drawing hoots and whistles from a crowd that had until then stuck to polite clapping. Alaska is a conservative state. Registered Republicans outnumber Democrats by a wide margin, but the state’s brand of conservatism has a pro-development, anti-government, libertarian flavor. Most people don’t see the mountain’s name change along partisan lines. Instead, some see it as a victory in the state’s long public lands tug-of-war with the federal government, while others, especially in the Alaska Native community, see it as a victory for indigenous rights. And pretty much everybody has been calling the mountain Denali for years. There’s also something worth explaining about the culture here. We put Alaska-ness before all else, and tend to view outsiders with suspicion. In Alaska, nobody really cares if you went to Harvard, but if your grandmother was buried here, you should say so because it gives you cred. I think this is because there are only 700,000 people in this state and a whole lot of dangerous country, animals and weather. People from very different backgrounds tend to find themselves relying on each other, so we care most about stuff like whether you are the type to carry a tow strap in your truck and would be willing to pull us out of a ditch in a snowstorm. Politics come way second. Our loyalty to Denali over McKinley is driven by the same impulse. Denali is ours, it comes from here, it carries a tow strap. McKinley isn’t and doesn’t. “As Alaskans we feel listened to and respected to have the federal government recognize the name we have had in statute since 1980,” she said via text message Tuesday. Not to say people aren’t cynical. Stieren viewed the name change, timed to coincide with the president’s Alaska visit, as a distraction from what local conservatives see as “greenie” views on environmental policy that people fear might stand in the way of resource development. The change is popular with Alaskans, he said, but a token gesture. “It’s the equivalent of your stepdad, who is never home, buying you a birthday present at the airport gift shop,” he said. The biggest losers coming out of the switch are several hundred businesses, from banks to dress shops, that are named after McKinley or sell products named after McKinley. Alaska McDonald’s, for example, sells a double-patty “McKinley Mac,” which might have to be renamed. Anchorage Mayor Ethan Berkowitz laughed when I asked him about Ohio politicians’ objection to the name change. “If folks in Ohio are really intent on naming Alaska places, maybe they’d let us name some of theirs?” he said. My aunt’s ex-husband who I still think of as an uncle, Paul Ewers, works as the city attorney in Fairbanks and lives in the neighboring community of Ester. He told me he’s not attached to the name McKinley because the mountain was named by a prospector during McKinley’s run for president in 1896. President McKinley never even visited. The change is most meaningful for Alaska Natives like Princess Daazhraii Johnson from Fairbanks, who is of Gwich’in and Koyukon Athabascan heritage. Alaska has the largest indigenous population per capita of any state. Johnson sees the name change as part of a wider shift toward valuing native cultures. She connected it with another recent victory for Alaska Natives: a bill signed last year that made 20 Alaska Native languages official languages of the state. “To have this sacred mountain that already had a name for thousands of years, it’s the highest form a disrespect to call it something else,” she said. Johnson’s grandparents, who had Athabascan names, were renamed with biblical names as children, she said. Denali means the “the tall one” in their language. I reached my sister-in-law’s good friend, Juneau fisherman Ajax Eggleston, on the deck of his boat while he was fishing for salmon in the Gulf of Alaska on Tuesday. He said he’d actually seen the famed mountain only once. He calls it Denali, but didn’t have much use for the politics. Julia O’Malley, a freelance writer and blogger, is the Atwood Chair of Journalism at the University of Alaska, Anchorage. Her grandmothers are both buried in Alaska. Find her work at juliaomalley.media.